Sheffield Tigers 2019 team. Back: Broc Nicol, Zaine Kennedy, Kasper Andersen, Drew Kemp. Front: Danny King, Kyle Howarth (Captain, on bike), Ty Proctor. Picture: Andy Garner. 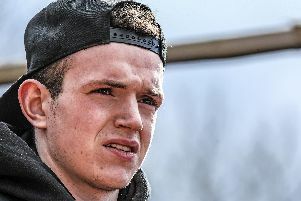 Teenage ace Drew Kemp says he feels his move to Sheffield has already been vindicated. The highly rated 16-year-old was in demand over the winter with almost every other club in the league chasing his signature. But it was the Tigers who Kemp felt he could progress with most. And while the season may not get underway until this Sunday(March 24, 4pm) at Owlerton, the British prospect already reckons he’s made the right decision. “We’ve spent a bit of time together over the past week or so as a team and it’s been awesome,” Kemp said. “We’ve been to visit sponsors together, we were at the Steelers Ice Hockey last weekend but to get some laps in together at Press Day on Wednesday was great. “Obviously that’s just about testing different set-ups on your bikes and getting used to the different racing lines. “But I had so much help from the rest of the team and I know that will be the same once the season gets going. “We’ve got the likes of Danny (King) and Kyle (Howarth) who are both good riders and who have got a lot of experience behind them. “But to have Simon (Stead) as team manager too is brilliant. “On Wednesday, every time I went out on track he was there watching me, giving me advice and telling me different things to try and again that should be a huge plus over the season. “I’ve done my homework over the winter watching as many races as I can on YouTube and by the end of Wednesday I felt really comfortable which was great. The Tigers launch their campaign this Sunday (March 24, 4pm) as they stage the Steel City Championship. The fixture celebrates the 90th Anniversary of the club and there’ll be an emotional moment when firm favourite Ricky Ashworth completes four laps on a tandem bike just over five years after his speedway career was ended due to a crash which left him with serious injuries.